Happy Feast of the Annunciation! I was so deeply into the spirit of Lent and preparing for Holy Week that it was a bit of a shock this morning to pray the Gloria at Mass this morning…but how fitting to pray this canticle of praise on the feast of the Incarnation, the feast of Mary’s “yes” to becoming the Mother of God! 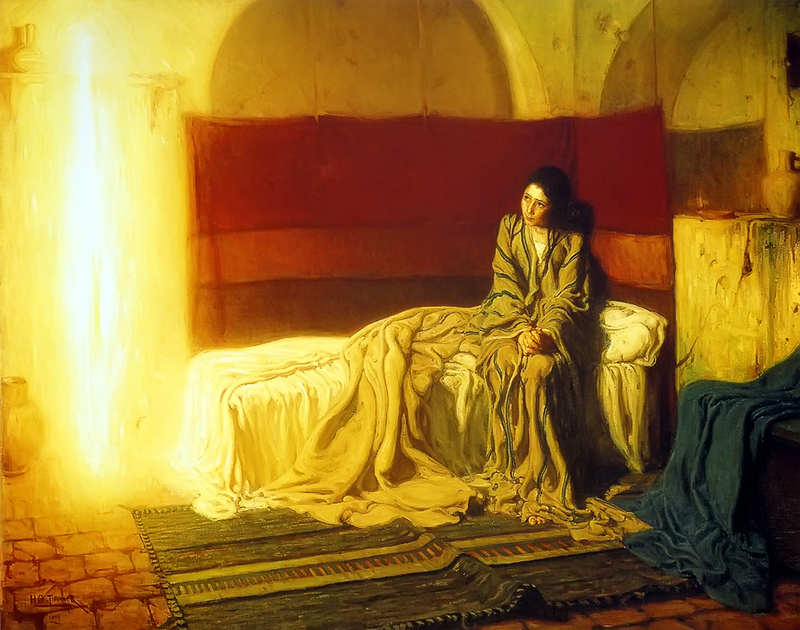 This is one of my favorite images of the Annunciation because it seems to capture Mary at a very ordinary, prosaic moment in her life, while at the same time emphasizing the mystery of the announcement–the angel Gabriel is brilliant but we cannot even distinguish the shape of his figure. At some point, I hope to offer here a guided meditation on discernment in the light of Luke 1:26-38 with this painting of the Annunciation. But for today as I seek to live in a spirit of discernment, I will carry in my heart Mary’s attentive gaze, her hands clasped in prayer, and her head tilted in wonder as she begins to grasp the radiance of God’s love for her and for all humanity.